Preheat oven to 350 degrees. Line a baking sheet with parchment paper. Place the halves of spaghetti squash cut side up. Transfer to the oven to roast for about 30 to 40 minutes, until tender with a fork. Remove from the oven and allow to cool for 5 to 7 minutes, until you can handle them. Using a fork, remove the seeds and discard. Scrape out the spaghetti squash from both halves and dump it onto the parchment paper. Sprinkle it with a few pinches of salt and squeeze lemon juice over the spaghetti squash. Give it a good mix and then transfer it back to the oven to dry out a bit, about 10 minutes. 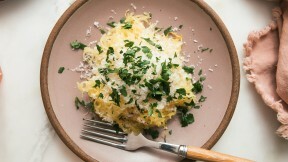 Divide amongst plates and then top with parmesan and Italian parsley. Serve immediately.